This post contains affiliate links. This means that if you decide to click through and make a purchase, I might receive a small commission that helps me keep the blog going. Thanks for your support! Have you seen the new book (and ebook) by Sophie Van Tiggelen, blogger at A Squirrel in the Kitchen? It's called Simple French Paleo. Sophie sent me a copy to have a look at and I can tell you two things. This book is BEAUTIFUL. The photography, the layout, the font - everything about it reflects the rustic French theme of the recipes. You flick through, and seriously feel like you're somewhere in rural France, with the scent of lavender wafting through the air, nibbling on a plateful of (AIP compliant, naturally) appetizers. The second thing is that it never ceases to amaze me what bloggers can achieve with the more limited ingredients available to AIPers. And this book is no exception. There's a raspberry pancake layer cake, grilled shrimp with aioli (yes, that's AIP compliant, too) and afternoon tea time cookies. There are roasts, stews, soups and veggie side dishes. 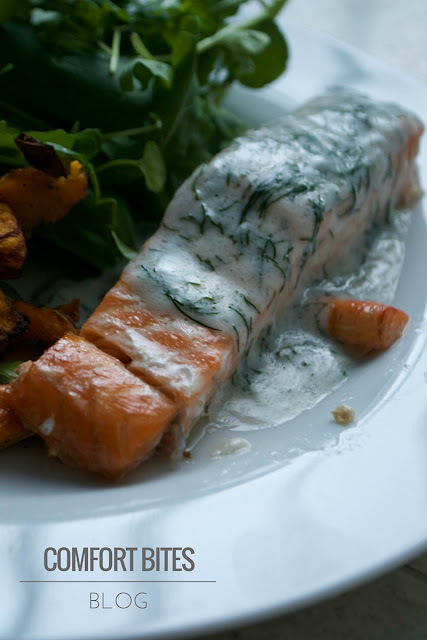 One of the first dishes I made from the book was the baked salmon with lemon dill sauce. I used to make creamy dill and lemon sauces using cream and butter and when I found out that dairy doesn't love me very much, I thought I'd never eat it again. But this recipe came very close to the original that I used to love. A big serving of chopped dill gives a fresh, aniseed flavour that the lemon helpfully lifts. I loved it. And it was so easy to make - easier I think than the old version - that I'll be adding it to our regular meals. There are 90 recipes in the book - that should keep you going for a while - and there's a balanced mixture - so you won't end up with a load of desserts if you're avoiding sugar - you'll find recipes in here for formal celebrations as well as a spontaneous lunch for two of you sitting in the garden on a sunny day. Negatives? It's difficult to come up with any, to be completely honest. The ebook is $18 ($9.99 on Kindle), which is a bit pricier than some others you can buy on AIP, but I really think the price reflects the work gone into the recipes, the design, stunning photography and the general quality of the book. I definitely think it's worth the price. Honestly. So my final verdict is this. If you've been AIP for a while and you want to extend your repertoire with some sophisticated, French-inspired dishes then this book is perfect for you. If you're new to AIP then you can just dive in and enjoy these recipes without feeling like you ever missed out on indulgent treats and satisfying dinners. The quality of the book is spot on. The photography will make you immediately book a flight to France. The recipes are true to the theme of the book, healthy, colourful and all AIP compliant. Find out more about Simple French Paleo on Amazon (available as a physical paperback book or an ebook on Kindle) or visit Sophie's Simple French Paleo page, where you'll find reviews, photographs and more. Have you cooked from Simple French Paleo? What did you think? What did you make? Let me know in the comments here or on Twitter, Instagram or Facebook.